Pressure of 1 g of an ideal gas A at 27 °C is found to be 2 bar. When 2 g of another ideal gas B is introduced in the same flask at same temperature the pressure becomes 3 bar. Find a relationship between their molecular masses. Let the partial pressure of H2 in the vessel be . Now, let the partial pressure of O2 in the vessel be . Hence, the total pressure of the gaseous mixture in the vessel is . Density of a gas is found to be 5.46 g/dm3 at 27 °C at 2 bar pressure. What will be its density at STP? Hence, the density of the gas at STP will be 3 g dm–3. Hence, the molar mass of phosphorus is 1247.5 g mol–1. A student forgot to add the reaction mixture to the round bottomed flask at 27 °C but instead he/she placed the flask on the flame. After a lapse of time, he realized his mistake, and using a pyrometer he found the temperature of the flask was 477 °C. What fraction of air would have been expelled out? Pay load is defined as the difference between the mass of displaced air and the mass of the balloon. Calculate the pay load when a balloon of radius 10 m, mass 100 kg is filled with helium at 1.66 bar at 27°C. (Density of air = 1.2 kg m–3 and R = 0.083 bar dm3 K–1 mol–1). Hence, the molar mass of the gas is 40 g mol–1. Hence, the partial pressure of dihydrogen is . The SI unit for pressure, p is Nm–2. It was found that for all gases (at any given pressure), the plots of volume vs. temperature (in °C) is a straight line. 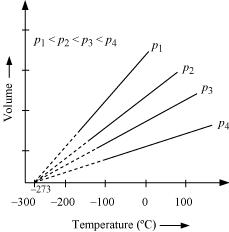 If this line is extended to zero volume, then it intersects the temperature-axis at – 273°C. In other words, the volume of any gas at –273°C is zero. This is because all gases get liquefied before reaching a temperature of – 273°C. Hence, it can be concluded that – 273°C is the lowest possible temperature. Critical temperature for carbon dioxide and methane are 31.1 °C and –81.9 °C respectively. Which of these has stronger intermolecular forces and why? Higher is the critical temperature of a gas, easier is its liquefaction. This means that the intermolecular forces of attraction between the molecules of a gas are directly proportional to its critical temperature. Hence, intermolecular forces of attraction are stronger in the case of CO2.